The Oxford dictionary defined the term “Islamophobia” as an irrational fear, hatred or prejudice against Islam or Muslims in general as a Political force. As the second largest population of the world, the followers of the Islam came from the different diverse ethnic and national background. It’s only a small number of extremists that were responsible to further flare-up this irrational fear among the mindset of the masses. The efforts have been done both within the community and by others to build the bridge by elaborating on the human values of the society particularly in relation with Islam. In the global scenario, the identity of the Indian Muslims has been unique as they imbibed larger cultural values from their context of which they were part and parcel down the centuries. In days when everything has been projected through the prism of religion, especially in the context of mainstream Indian media, I found many wonderful friends on social media especially on twitter and facebook outside of my faith. For these guys, the religion seems to be a matter of personal practice and they have a cognitive ability to rationalize the issue beyond this narrow prism. The efforts have been done by Indian Muslims against growing phenomenon of “Islamophobia” by raising the awareness of our syncretic values especially in relation to the history of Islam in the Indian subcontinent. The syncretic culture was evolved down the centuries in the timeline of Indian history by the fusion of diverse cultures and civilizations. For me, the Twitter handles @DilliKiRanaiyan, @urdualfaz, & @shairoftheday managed by noted author and historian Rana Safvi is an example to spread a message of harmony by erasing the boundaries of caste, creed & religion of our stratified society. She used language, Urdu Poetry, and monuments as a tool for the likeminded people to come closer by sharing the bonds of love. One of my friends has created a Facebook page titled “India against Islamophobia” and “Indo Islamic Culture” to share the secular views of many Non-Muslims and Muslims to counter the extremist ideologue within the community & fear among the others. The blog “Purani Dilli Walon Ki Batein” @PDWKB formed by a young engineer Abu Sufiyan is also an attempt to elaborate on the unique culture of the walled city that carries many layers of time hidden behind its narrow lanes and crumbling havelis. In January 2018, Juggernauts publication released a book authored by a communication consultant Nazia Erum with a title “Mothering a Muslim”. The book is based on her explorative research where she came up with stories of Islamophobia creeping the minds of the young school going children. The little minds outpoured their reactions that were received on the other end in the form of peer abuse & peer bullying. The work of Nazia also rings the alarm bell in corridors of an educational environment where abuse and prejudice based on certain selective identities of gender, faith & caste are highly underreported. It’s also an attempt by the author to educate and raise the awareness among its stakeholders regarding the selective peer bullying and abuse reported by her from schools. Thankfully book received the wonderful reviews and responses from its diverse readers. I left India in 2011 for a job in a newly established medical School in Saudi Arabia as a medical educator specialized in Human Anatomy & Embryology. Every expatriate population has to face challenges in adjusting to different cultural and linguistic context of another country. Somehow it was same for me here in Saudi Arabia. My workplace was located in a newly emerging city where multiple ethnicities were recently recruited as an academic workforce for the upcoming University. In these circumstances, the people from the common nationality and cultural background usually came up as a facilitator for acclimatizing you in the new environment. In this diverse environment, I found some of my best relations among Indian expatriates. They all came from different faiths, regions, and cultures. Whether its an occasion of birthday/ anniversary or challenging time such as illness or death of any loved one in our home countries, this small cohort made up of Indians and few Pakistanis always stood with us like a family member. There was no differentiation between region, religion and culture. In last seven years, it was the first time we are going to stay during the month Ramzan in Saudi Arabia. In all previous years, the month of Ramzan overlapped with the summer vacations fixed on Gregorian calendar. As usual with the trend of back home, the Iftar parties started in our little South Asian family. 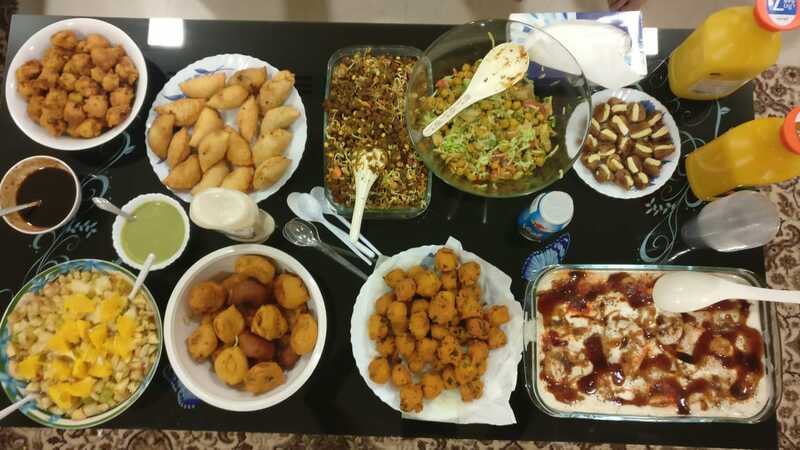 On 07th of the Ramzan (23rd May), we were invited for the Iftar by one of our Indian friend and colleague from University. He is Hindu by religion and comes from the traditional family of Bihar. Back home, a decade before, these type of Iftars were organized by the politicians and most of them were saving faces for vote greedy politics of developing democracies. In the 21st century India, the interfaith Iftar emerged as a tool of Urban middle class to build bridges of peace and collateral existence. Coincidentally, the day when I received the invitation, there was a reminder call on Facebook by Nazia Erum, the author “Mothering a Muslim” for interfaith Iftar, an event pioneered by her last year. The same day, a Muslim couple from Nirala Estate housing society, Noida extension where I have my own residential apartment notified on social media for the Iftar. It was a collective effort of the housing society members for volunteered residents coming from the different religious background having an iftar on this auspicious month. On the same day, I received home cooked Iftar parcel distributed by one of our beloved Hindu friends at Al Majmaah. On 26, May, @TheMuslimsofIN organized a public Iftar where they distribute more than four hundred meal box to the needy people at AIIMS. The organizer, Mr. Anas Siddiqui (@Vakeel_Sb ‏) said its main objective was to revitalize the real spirit of Ramazan i.e., sharing the feed among the needy masses. The author & historian @iamrana tweeted on the objective of the #Iftaar4All who was also the part of this campaign. "The purpose is to show all Indians can come together irrespective of religion, caste, Creed and do their little but to help. To break misconceptions, to break barriers. When u provide a meal u become a friend. " Coming back to our context, we reached his accommodation located at our University housing compound at 5.50 PM. By next half an hour, all the other invitees showed up. While waiting for the Iftar on the dining table, I could saw the diverse background of the guest present there. An early days friend from Banglore, a Brahmin by background who is always standing with us in the time of need. He and his wife were fasting from the last couple of days to understand the flavor and experience of his Muslim friends during Ramzan. Next in the line was a friend following Jafari school of Jurispendence who broke his fast approximately ten minutes after us. A Kashmiri Colleague who hold the doctorate degree from one of the prestigious Universities of the western country with his European wife of Arab origin. A principal of Indian Embassy school who is supervising the academic responsibilities of learning center catering school children from diverse ethnicities, nationalities, and religions. Along with few other Indian colleagues & friends, the two Pakistani colleagues were also present. One from Karachi whose ancestors hail from the homeland of our host i.e, Bihar and other one was Muslim Punjabis from Lahore. Our host did all his best efforts to serve his guest from Iftar to dinner by reflecting his love and compassion. After Maghrib prayers, the tea was served. Those who volunteered left for Isha Salah and Tarawih. The rest of them enjoyed the nice time at our host drawing area. The dinner was served for all the families at 10.30 pm. Each of the items was cooked at home with a blend of veg and non-veg dishes taking care of individual food priorities. During the light moments of chat, I intruded with my personal notion why this Iftar is quite special to me. Talking about the value of Interfaith Iftar in changing days, I introduced them to the book “Mothering a Muslim”. Then narrated them the story reflecting “Sallan bhai” perverted ideology. I was looking forward to the consent from our beloved host and other invitees to write a reflective account on the event that contrasted with “Sallan bhai” version of the life in Gulf. What was surprising to me is the detachment of all the people from polarized ideologies that have been flare-up day & night by our mainstream media to raise their commercial ratings. The consent was immediate and after some light jokes, all of them came back to their local issues mainly moving around the nationalization of Gulf countries that compelled hundred of the thousands of South Asian expatriates to leave for their countries in last two years especially from Saudi Arabia. I think Sallan bhai was unfortunate who was not able to avail the environment of the brotherhood that also prevails among the Indian expatriate communities living in Gulf countries. Sallan bhai also might be not aware of the fact that one in every sixth from four million Indian expatriates in Saudi Arabia came from Vasudevan region. A substantial number of them belonged to the same faith of Vasudevan who were responsible for running Indian cafes to the grocery stores. It seems to be unbelievable that Sallan bhai never has a chance to have the meal or grocery product from the cafe /shop run by a south Indian Hindu. The story of the “Sallan bhai” is an eye-opener for us. Our children will learn what we will reflect on our own practices. The majority of the educated Indian Muslims has created the same environment what I reflected above from my context in Gulf countries and especially from Saudi Arabia. Though in minority, the context of “Sallan bhai” is also the harsh and unfortunate reality of educated Muslims across the globe. We must educate ourselves on the true values of humanity embedded teachings of real Islam and its syncretic traditions. Here is the other reciprocal reason for reading “Mothering a Muslim” for insiders that will provide them an understanding to cope up with horrible ideologues emerging from the community itself. Hope we will overcome hate by spreading the message of love and removing the shackles of the bigotry as worn by the “Sallan bhai” in the name of Islam. Nazia Erum, Mothering a Muslim, The dark secrets in our schools and playground, Juggernaut publications, 15 December 2017. Rehan Bhai it seems that you have put in a lot of effort in coming up with this write-up. This gave me an opportunity to take a peek at your life in Saudi. Keep up the good work. Thanks, Khalid for providing such a specific and constructive feedback. Thanks Dr. Rehan Asad for your critical analysis and explain beautiful, I proud to be an Indian we love and respect all religion. I can proudly say I am very lucky person to have friend like you. A very nicely written article, Rehan. Ultimately, it’s love, peace and harmony that is triumphant over the hatred. A community in actuality is not what is projected by media. Personal experiences are different from the what we hear or see about some individual or a group. As you rightly highlighted, we must come close to each other and communicate more often in-person (lesser on social media) to understand and empathize with our brethren in the country and in the global village. Thanks, Javvad for this lovely feedback and showering lot of love. Agreed with your notion, love & peace is always triumphant over hatred.